Study after study shows that the total energy used during the life of a typical home in Canada could be reduced by at least 50% percent while also reducing the home’s long-term cost by approximately $150,000.00. With high winter heating bills on the horizon in much of the country, this statement becomes apparent. Simply increasing the thickness of exterior walls will dramatically decrease a typical new home’s energy consumption. Over the life of the home, an increase in initial purchase price and financing would be offset by lower energy and maintenance costs. And even though some energy efficient home features are expensive, there are others that most home buyers can afford. 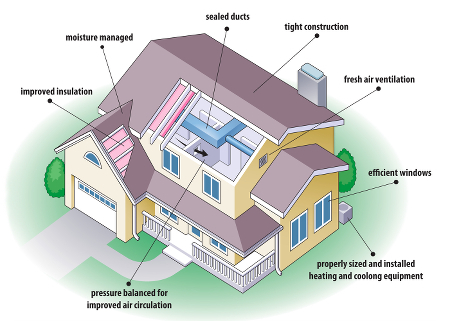 While design, costs, options, and styles vary, most energy efficient homes have some basic elements in common: a well-constructed and tightly sealed thermal envelope; controlled ventilation; properly sized, high-efficiency heating and cooling systems; and energy efficient doors, windows, and appliances. A thermal envelope is everything about the house that serves to shield the living space from the outdoors. It includes the wall and roof assemblies, insulation, air/vapour barriers, windows, and weather-stripping and caulking. Most builders use traditional wood frame construction. Wood framing is a “tried and true” construction technique that may use a potentially renewable resource (wood) to provide a structurally sound, classically constructed house. Structural Insulated Panels (SIPs): These sheets are made of plywood or oriented-strand board (OSB) that is laminated to foam board. The foam may be 4 to 8 inches thick. Because the SIP acts as both the framing and the insulation, construction is much faster than stick framing. The quality of construction is often superior because there are fewer places for workers to make mistakes. Insulating Concrete Forms (ICF). Houses constructed in this manner consist of two layers of extruded foam board (one inside the house and one outside the house) that act as the form for a steel-reinforced concrete center. ICFs are the fastest technique and least likely to have construction mistakes. Such buildings are also very durable and easily exceed code requirements for areas prone to tornadoes or hurricanes. Because the insulated concrete can resist sudden temperature change, homes built this way seem to be, dollar for dollar, most energy efficient. An energy efficient house has much higher insulation R-values than required by most local building codes. An R-value is the ability of a material to resist heat transfer, and the lower the value, the faster the heat loss. For example, a typical house in Ontario might have the insulation of R-22 in the exterior walls and R-50 in the ceiling, while the floors and foundation walls may not be insulated. A similar, but well-designed and constructed house will have insulation levels that range from R-40 to R-50 in the walls and from R-50 to R-70 in the ceilings. Foundation walls and slabs should be as well insulated as the living space walls. Poorly insulated foundations have a negative impact on home energy use and comfort, especially if the family uses the lower parts of the house as living space. Also, appliances—such as domestic hot water heaters, washers, dryers, and freezers— that supply heat as a byproduct are often located in the basement. Water vapour condensation is a major threat to the structure of a house, no matter what the climate. In cold climates, pressure differences can drive warm, moist indoor air into exterior walls and attics. The air condenses as it cools. A vapour barrier is a material or structural element that can be used to inhibit the movement of water vapour, while an air barrier can hinder airflow, into and out of a house’s envelope. How to design and install vapour barriers depends a great deal on the climate and the chosen construction method. However, any water vapour that does manage to get into the walls or attics must be allowed to escape. Regardless of climate, water vapour migration should be minimized by using a carefully designed thermal envelope and sound construction practices. Systems that control air and water vapour movement in homes relies on the nearly airtight installation of sheet materials on the interior as the primary barrier. The typical home loses more than 25 percent of its heat through windows. Even modern windows insulate much less than a wall (R-2 to R-5). Therefore, an energy efficient house in a heating-dominated climate should, in general, have few windows on its northern, eastern, and western sides. The total window area should also not exceed 8 to 9 percent of the floor area for those rooms unless the designer is experienced in passive solar techniques. If this is the case, then increasing window area on the southern side of the house to about 12 percent of the floor area is recommended. This is often called solar tempering. A properly designed roof overhang for south-facing windows will help prevent overheating in the summer. North, east, and west windows should have low Solar Heat Gain. South windows with properly sized overhangs should have a high SHGC to allow winter sun (and heat) to enter the house. The best windows are awning and casement styles because these often close tighter than sliding types. You should seal air leaks everywhere in a home’s thermal envelope to reduce energy loss. Proper air sealing alone may reduce utility costs by as much as 20 percent when compared to other houses of the same type and age. You can accomplish most air sealing by using two materials: caulking and weather-stripping. Caulking can be used to seal areas of potential air leakage into or out of a house. And weather-stripping can be used to seal gaps around windows and exterior doors. Since energy efficient home is tightly sealed, it needs to be ventilated in a controlled manner. Controlled, mechanical ventilation prevents health risks from indoor air pollution, promotes a more comfortable atmosphere, and reduces air moisture infiltration, thus reducing the likelihood of structural damage. Furnaces, water heaters, clothes dryers, and bathroom and kitchen exhaust fans expel air from the house, making it easier to depressurize an airtight house if all else is ignored. But natural-draft appliances may be back-drafted by exhaust fans, which can lead to a lethal buildup of toxic gases in the home. For this reason, sealed-combustion heating appliances, which use only outside air for combustion and vent combustion gases directly to the outdoors, are crucial for ventilation energy efficiency and safety. Heat recovery ventilators (HRV) or energy recovery ventilators (ERV) are growing in use for controlled ventilation in airtight homes. These ventilators can salvage about 65 percent of the energy from the stale exhaust air and transfer that energy to the fresh air entering by way of a heat exchanger inside the device. They can be attached to the central forced air system or may have their own duct system. Uncomfortable incoming air can be a serious problem in northern climates and can create moisture problems in humid climates. Specifying the correct sizes for heating and cooling systems in airtight, energy efficient homes can be tricky. Rule-of-thumb sizing is often inaccurate, resulting in wasteful operation. Conscientious builders and heating, ventilation, and air-conditioning contractors size heating and cooling equipment based on careful consideration of the thermal envelope characteristics. Energy efficient homes require relatively small heating systems, typically less than 50,000 Btu/hour even for frigid climates. Some require nothing more than the sunshine as the primary source of heat along with auxiliary heat from radiant in-floor heating, a standard gas-fired water heater, a small boiler, a furnace, or electric heat pump. If an air conditioner is required, it’s often a small unit and sufficient for all but the warmest climates. Sometimes only a large fan and the cooler evening air are needed to make the house comfortable. The house is closed up in the morning and stays cool until the next evening. Smaller-capacity heating and cooling systems are usually less expensive to buy and operate. This helps recover the costs of purchasing more insulation, and other energy-efficient products, such as windows and appliances. Carefully selected and placed vegetation in any climate also contributes to reduced cooling and heating loads. Appliances with relatively high operating efficiencies are usually more expensive to purchase. However, higher efficiency appliances provide a measure of insurance against increases in energy prices, emit less air pollution, and are attractive selling points when the home is resold. Home buyers should invest in high-efficiency appliances—such as water heaters, clothes washers and dryers, dishwashers, and refrigerators—especially if these machines were used a great deal. Energy efficient lighting helps keep energy bills down by producing less heat and reducing cooling requirements. Fluorescent lighting, both conventional tube and compact, is generally the most energy efficient for most home applications. Alternative energies like solar and the wind will increase in value as fossil fuel prices escalate. Solar collectors, solar hot water systems, heat storage vaults, photovoltaic electricity, solar panels, solar greenhouses and solar house plans will become more important in this century. According to Buckminster Fuller, “We have wandered too far from the roots.” An energy crisis can only be avoided if we learn to rely on a diffuse, sustainable resource like the sun. Houses that incorporate all of the above elements of energy efficiency have many advantages. They feel more comfortable because the additional insulation keeps the interior wall at a more comfortable and stable temperature. The indoor humidity is also better controlled, and drafts are reduced. A tightly sealed air/vapour barrier reduces the likelihood of moisture and air seeping through the walls. They are also silent because the extra insulation and tight construction helps to keep exterior noise out. But these houses also have some potential disadvantages. They may cost more and take longer to build than a conventional home if the builder is not familiar with the new construction techniques and products available on the market. Even though the house’s structure may differ only slightly from conventional homes, the builder and contractors may be unwilling to deviate from what they’ve always done before. They may need more training if they have no experience with these systems. Before you start a home-building project, the construction site and its climate should be carefully evaluated to determine the optimum design and orientation for the house. Decisions regarding appropriate windows, doors, and heating, cooling and ventilating appliances are central to an efficient design. Also, the cost, ease of construction, the builder’s limitations, and local building code compliance should be competently evaluated. Some plans are relatively simple and inexpensive to construct, while others can be extremely complex and, thus, expensive. Construction costs can vary significantly depending on the materials, construction techniques, contractor profit margin, experience, and the type of heating, cooling, and ventilation system chosen. Because energy-efficient homes require less money to operate, many lenders now offer energy efficient mortgages They typically have lower points and allow for the stretching of debt-to-income ratios.